SCVHistory.com LW3286 | Film-Arts | Cary Elwes, Eric Allan Kramer in 'Robin Hood: Men in Tights,' Sand Canyon, 1993. 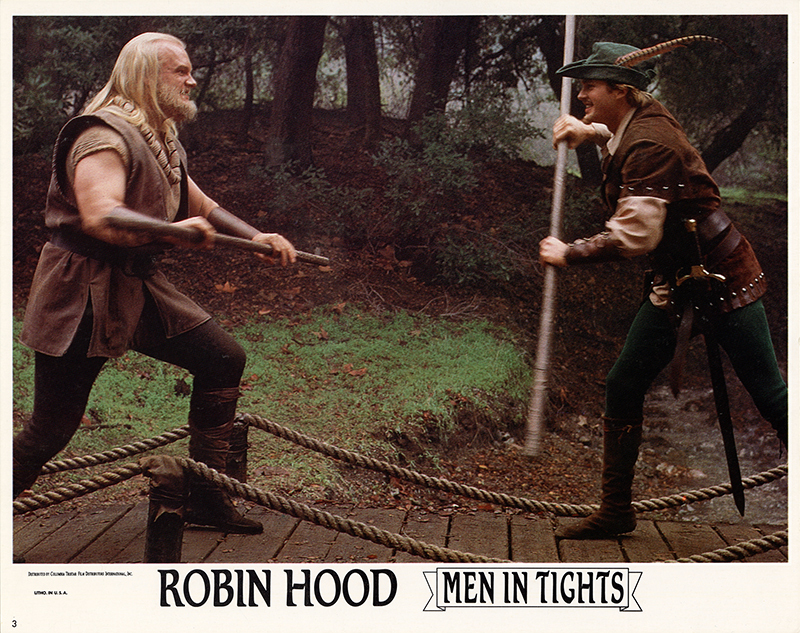 Eric Allan Kramer (Litle John), left, stops Cary Elwes (Robin) from crossing a footbridge at the Sable Ranch/Rancho Maria in Mel Brooks' "Robin Hood: Men in Tights" (Twentieth Century Fox 1993). Lobby card No. 3 (of 8), 11x14 inches, color halftone. LW3286: 9600 dpi jpeg from original lobby card purchased 2018 by Leon Worden.